Which other used SUVs are also worth a test drive? If the Juke’s funky design is what attracts you, also try the Mazda CX-3 and Renault Captur. Both follow the formula introduced by the Juke, which is to create a compact SUV that’s easy to drive and park but also attracts a few admiring glances wherever it goes. A popular alternative is the Mini Countryman, which spans a similar price range to the Juke. Another quirky contender for used car buyers is the Citroen C4 Cactus. It’s the car that set tongues wagging for its protective rubber inserts in the doors and bumpers – although bear in mind that the back windows don’t wind down. Instead, they are hinged, which isn’t ideal for passengers sat in the back. Other cars of this type and in a similar price range to Nissan’s Juke include the Fiat 500X, Peugeot 2008 and Vauxhall Mokka. If your heart is set on the Juke then you must be prepared to make sacrifices, as this is not an especially practical car. Given the car’s sales success, that’s clearly not an issue for many motorists who are grateful to Nissan for having the courage to design a car that looks out of the ordinary – like the lovechild of a car and a Nike running shoe. You sit higher than in a similarly sized hatchback. The inspiration for the Juke’s layout came from the design of motorbikes. 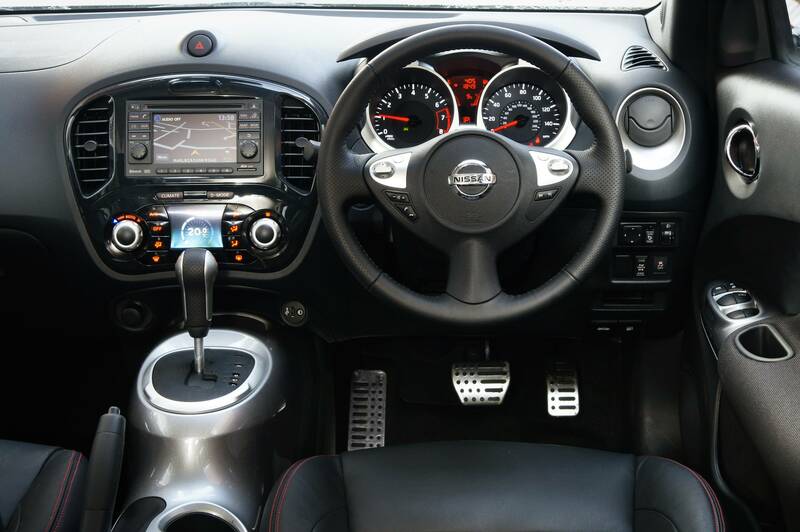 Between the front seats is a centre console that is meant to mimic the fuel tank of a sports bike, above sits a small, rather fiddly climate control and infotainment system, and in the driver’s eyeline are a pair of sporty-looking dials. The problems start when you settle in the seat and stretch out; there’s not a lot of space. 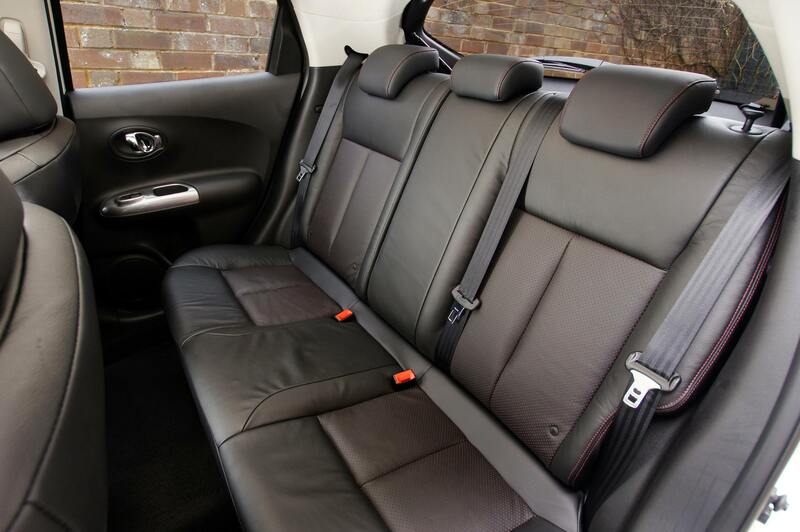 Try the back seat for size and it’s even more snug, while the boot is more handbag than travel bag, with just 251-litres on cars made before mid-2014. (It was increased by around 100 litres.) That’s less than many superminis, like the Ford Fiesta. At its launch, in 2010, there were three main trim levels for the Nissan Juke: Visia, Acenta and Tekna. Find a used entry-level Visia and as a minimum, it should come with alloy wheels, air conditioning, traction control and six airbags. Acenta adds 17-inch wheels, climate control, a USB port and Bluetooth, while the range-topping Tekna includes leather seats, Nissan Connect (which is an upgraded navigation and audio system) and a rear-view camera - the latter a useful addition, given the car’s shape, makes it hard to see much out of the back when parking. Models built after the facelift in June 2014, benefited from improved interior quality and a slightly smoother ride. Nissan added its various safety systems, including Safety Shield, Around View and Blind Spot Warning, meaning drivers benefitted from an extra pair of eyes when on Britain’s busy roads. 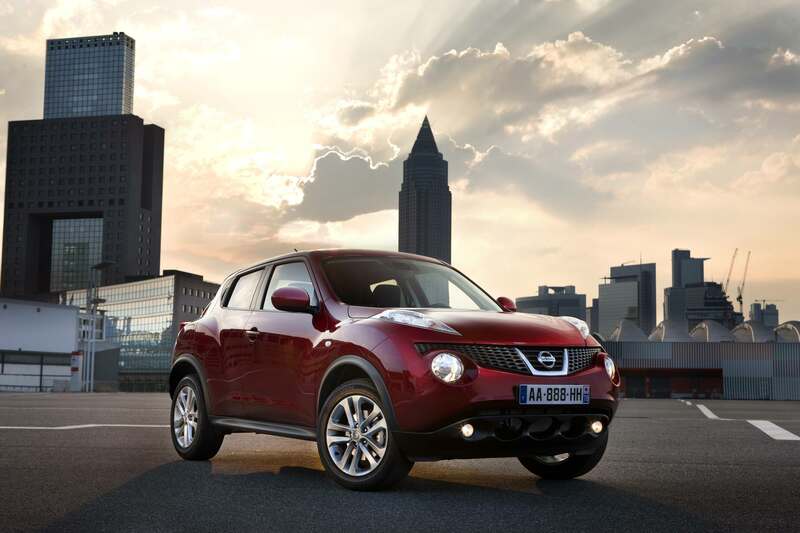 The Juke was last tested in 2011 by Euro NCAP, the independent organisation that assesses the safety of new cars. It was awarded the maximum five-star rating, in Tekna trim. As a minimum, all models come with five seat belts, anti-lock brakes, front and side-impact airbags for the driver and passenger and traction control. For families with child seats, there are two Isofix mounting points in the back, and it also features a deactivation switch for the front passenger seat’s airbag. Models above the entry-level Visia also come with electronic stability control. It’s worth adding that the Juke has been subject to a large number of recalls, in order to rectify safety-related problems with some models. Always check that these recalls have been carried out, by contacting the vehicle manufacturer and providing the details of any Juke you are considering. It’s happiest in town, where the raised seating position and compact dimensions mean it’s easy to manoeuvre. Like a small child that can’t sit still, the Juke is a little on the hyperactive side to drive and never seems to settle down. Nissan attempted to address this, with changes to the suspension of facelifted models, but to be honest all models fidget around and won’t feel relaxing on a long trip. There is a choice of petrol and diesel engines, and some models could be ordered with an automatic gearbox, although it is of a type (known as a continuously variable transmission) that can seem noisy and annoying at times. The 1.5-litre diesel engine is not only the most frugal, it’s probably our pick of the range overall. In a facelifted Juke, it returns up to 70mpg, and costs just £20 to tax. If all you care about is getting the youngest car with the lowest mileage, then pick the 1.6-litre petrol, which starts from as little as £4,500. However, be warned that the fuel economy will be 44mpg at best; a diesel manages up to 70mpg and won’t cost much more to buy. Dealers have a plenty of choice of early Jukes with the 1.6-litre petrol engine in a range of trim levels. Just pay close attention to the mileage and service history. This would be the sweet spot in the range. The diesel engine is a willing performer, gives good fuel economy and the age and mileage of cars isn’t too high. Cars in this price range will be facelifted, with extra equipment and safety features. They’ll also feel comparatively new.